There is a new colour joining the True Beadz family on June 15 called Shadow along with a new barrel shaped silver bead called Dragon Shadow. If there is anyone unfamiliar with True Beadz, they are made by a husband and wife team in Russia. 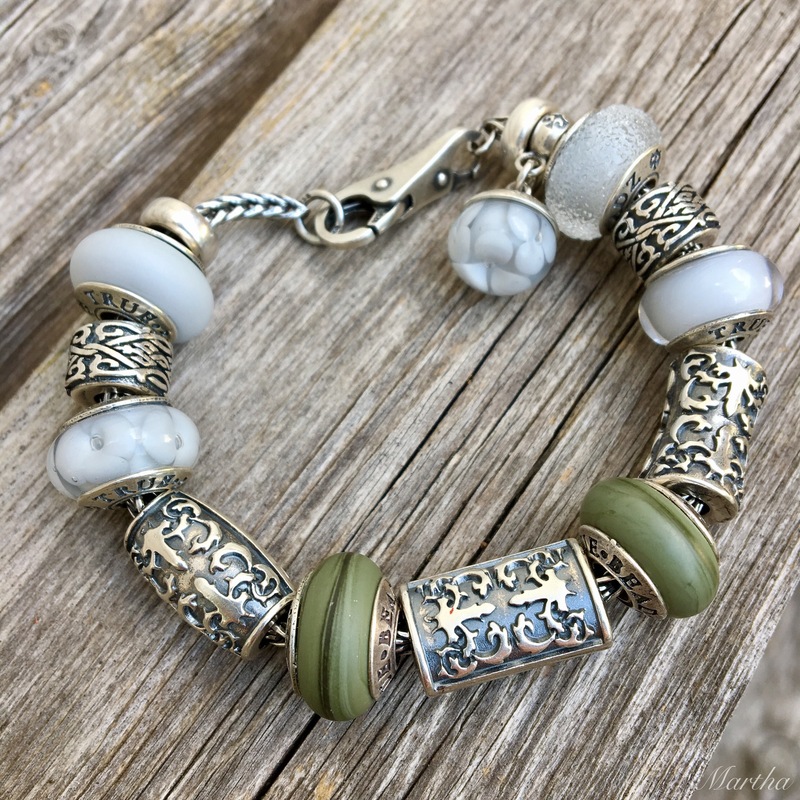 The main collection glass beads come in a clever assortment of finishes and looks. The first on the left is called Blossom, then Touch, which is a lovely matte finish that feels really nice. Then there is Air followed by Taste, which looks like it’s covered with sugar. Lastly, there is a Dangle in the Blossom pattern. So first you say the finish and then you say the colour, like True Blossom Shadow. The glass beads are $28 USD, the dangle is $45 USD and the Dragon Shadow is $80 USD. Here is an up close picture of the dangle. I really love this colour as it makes me think of putty. Not sure why I find putty appealing, but anyway, I do! 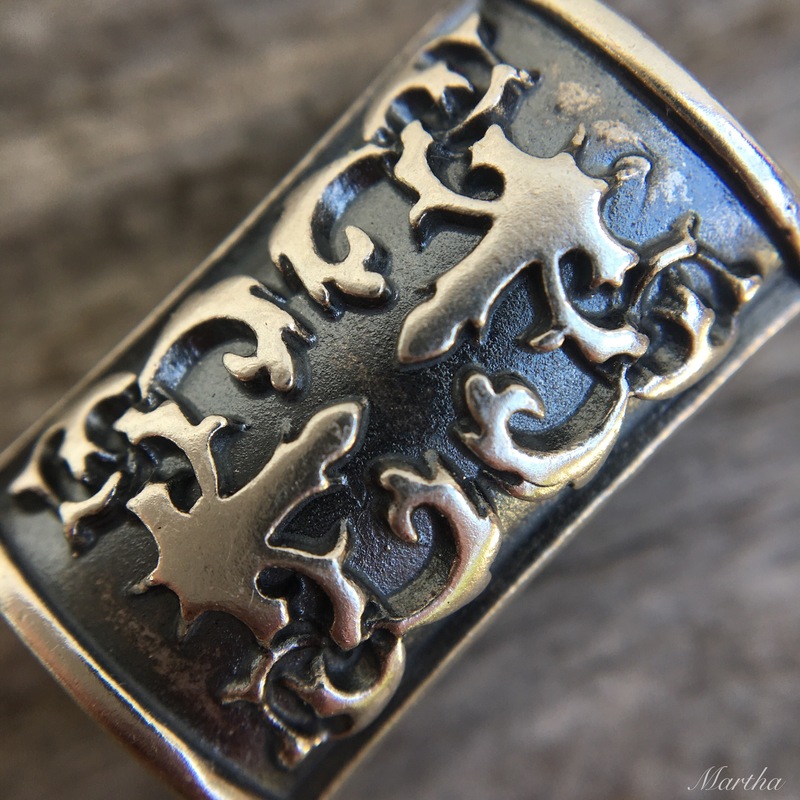 The Dragon Shadow silver charm comes in three shapes, as seen in this bracelet below. Here is an up close shot. I love the design. I wanted to match up the Shadow colour with some other colours from the True Beadz collection and the first combo I liked was with a soft yellow called Sunlight Spot. Just a note, two of the Dragon Shadow shapes do not fit on a Trollbeads bangle, numbers 8 and 10 from above. 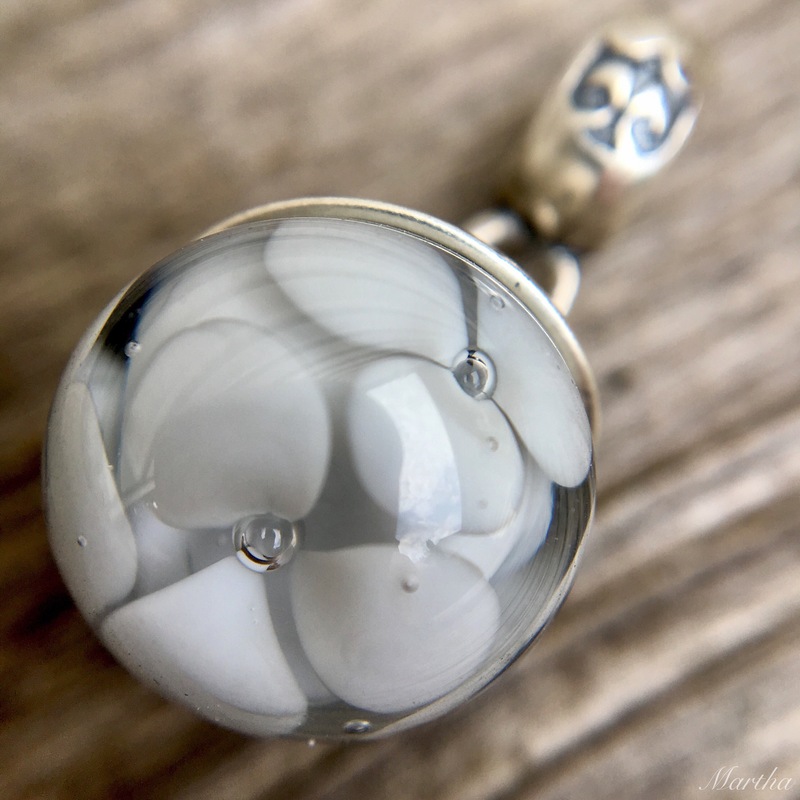 It’s like the Trollbeads Deep Ocean, they are too long to go round the curve. Julia says all three shapes fit on a Pandora bangle though. I don’t have a Pandora bangle, so couldn’t try it out. 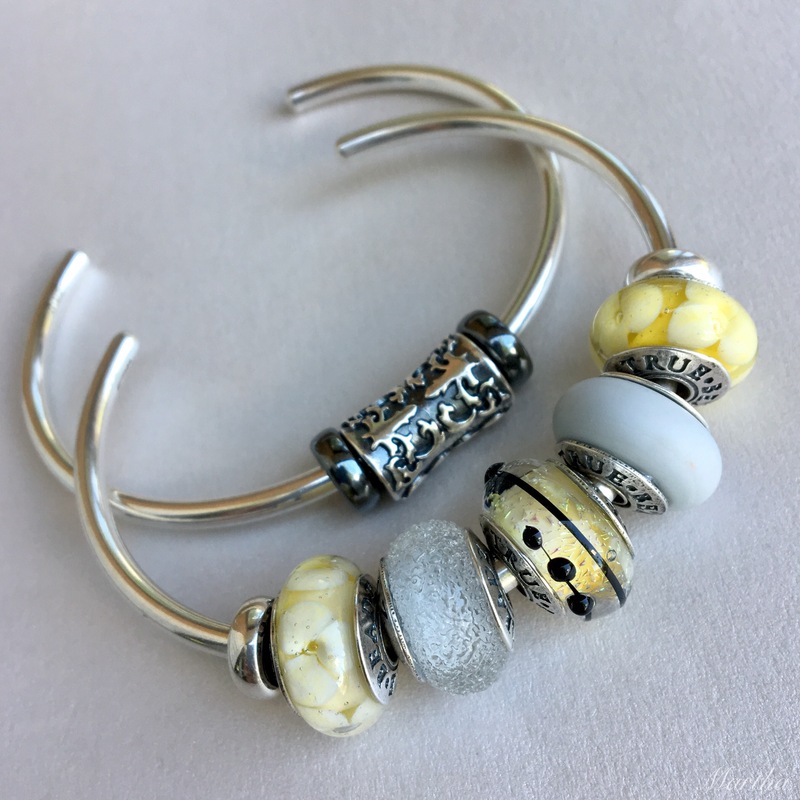 The yellow and black bead in the middle is a True Treasure. The next colour I tried Shadow with is Lilac. So pretty! Again, the one in the middle is a Treasure. Next up is Dragon Green. 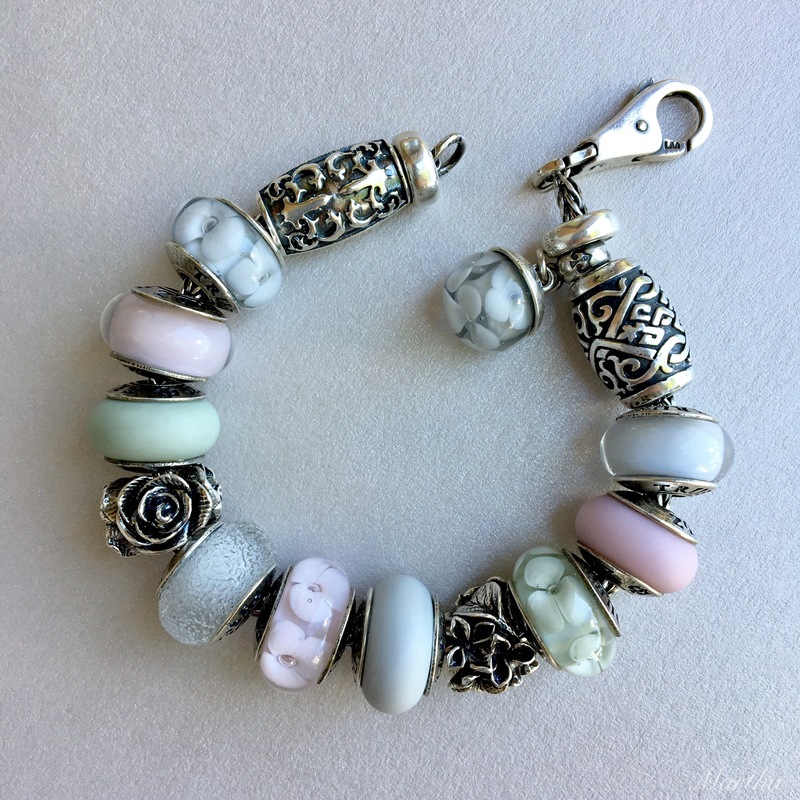 This bracelet below is my favourite as I love the contrast between the delicate pastel colours and the strong silver beads. The colours used here are Shadow, Linen and Baby Pink. 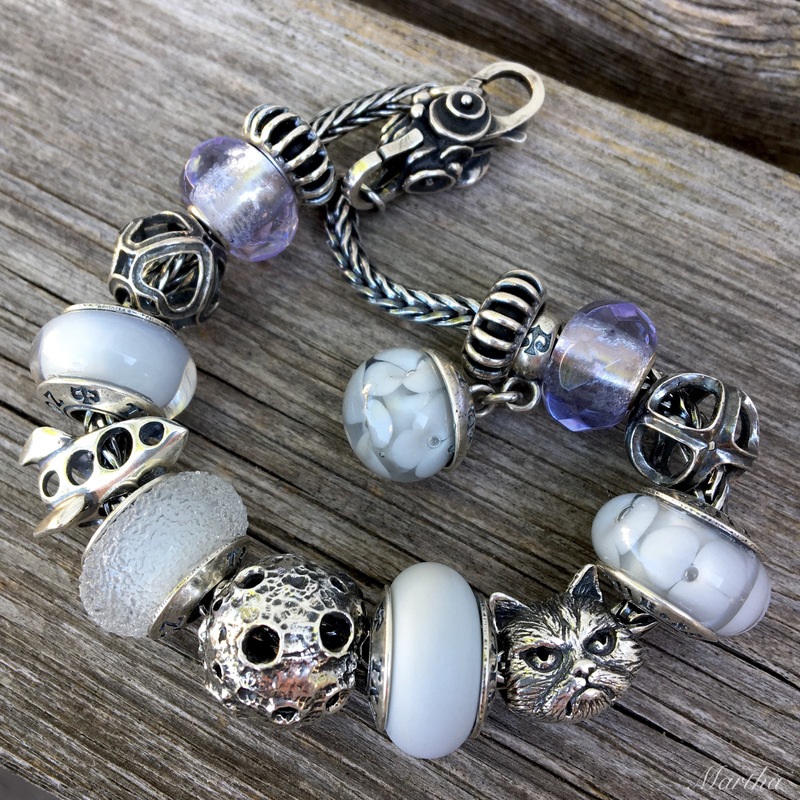 The grey colour of the Shadow beads looks fab with a couple of True Treasures. Lately Pandora has been using a combo of grey and orange in some of their ads and I tried those two colours together but wasn’t happy with it. Maybe someone else can pull it off, though. Lastly, I made a fun Grumpy Cat goes to the moon bracelet. I thought the Shadow colour made me think of walking on the cold, bleak moon. 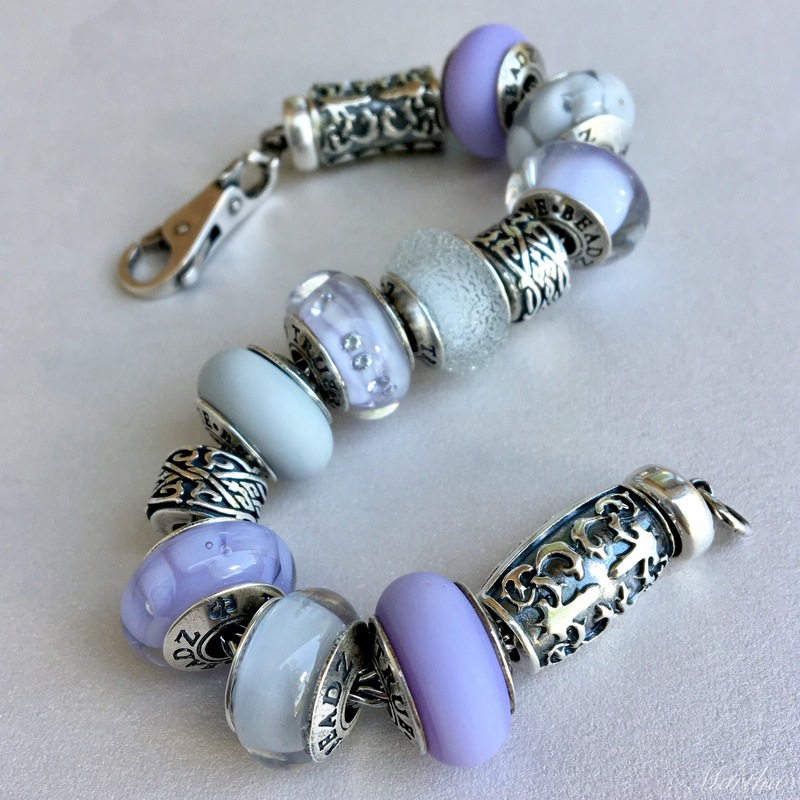 The Trollbeads Lavender Prisms add a bit of brightness. I really think Shadow is a super addition to the True Beadz line. Neutral colours can be so useful and I especially love how it looks with the Sunlight Spot, Linen and Baby Pink shades. If you are planning on buying anything from this release how do you picture using it? I love every combination you’ve done here, Martha! The Touch beads are probably my favorite, I think. I like the Dragon Shadow bead alot and the size comparison is very helpful. But I don’t know why you have to agitate Grumpy cat the way you do! LOL! Glad you found the size comparison helpful, Suzanne. Have a great day! Love your photos, as always, Martha! The new glass color is so versatile, and I liked seeing the different ways you used it. I think the Dragon Shadow silver is my must-have from this collection, though. Thanks for the heads up about which bracelets they fit on, and the size comparison photo was really helpful. Glad to be of help, Kim. I really like the hourglass shaped Dragon Shadow on a bangle and that’s what I’m wearing today. The new glass colour is definitely versatile–I could have spent an entire day trying out combos, ha ha! I am in love with True Beadz. This latest collection is no different. The Dragon Shadow silver is gorgeous. 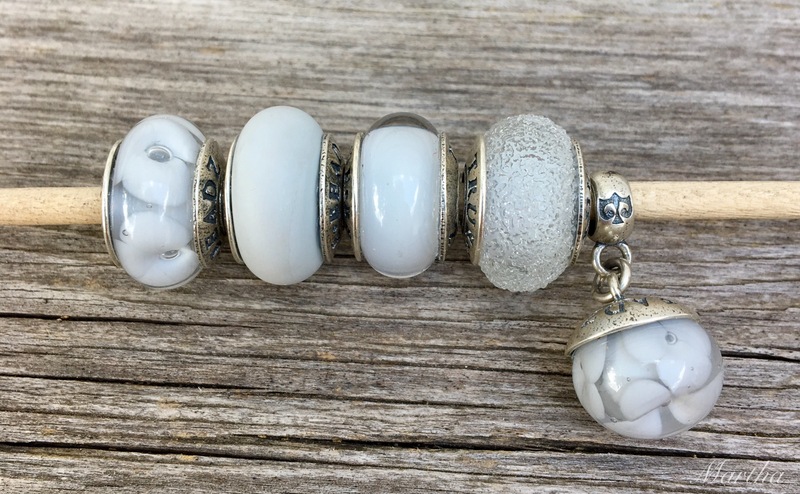 Once again, they have created something unique to the bead world in design. I can’t get enough of their glass. I am excited to see the newest collection all together like this, and it so soft and beautiful. 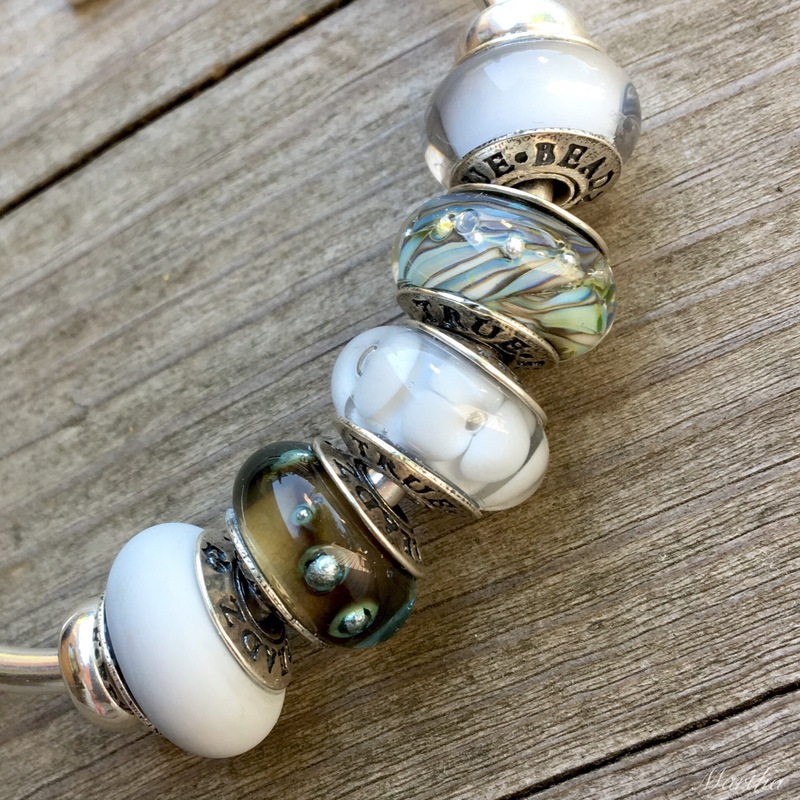 You know that I lean towards bright coloured beads, but I do think that your combos which use pale, subtle colours in between more patterned or highly complex designs as well as colours, are very complimentary. 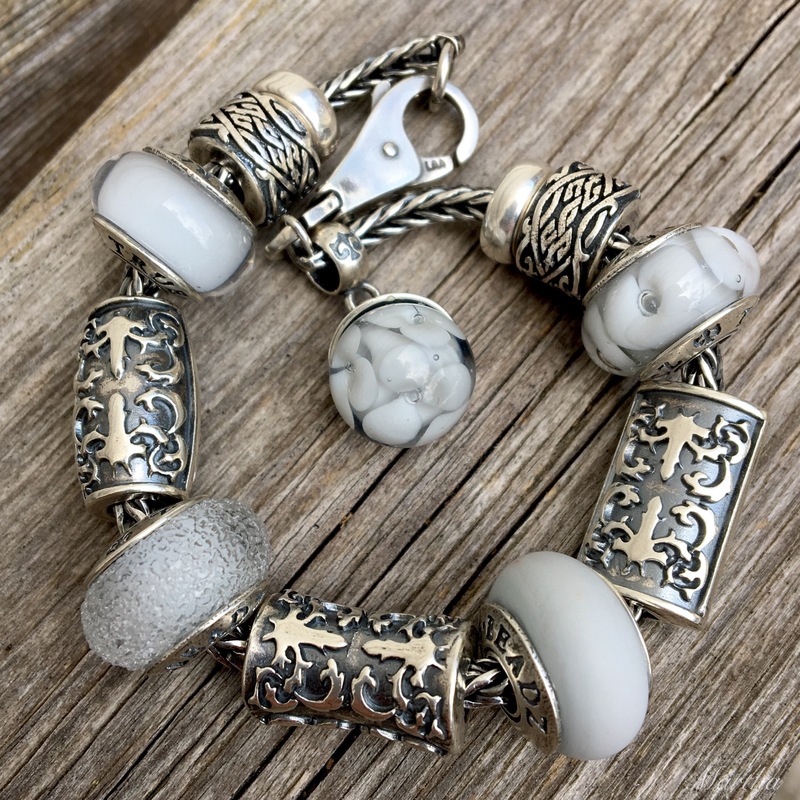 In particular, the Shadow beads look amazing combined just with silver beads, making each bead stand out and glow. I look forward to seeing them in person. I like your point about the subtle colours being complimentary to the complex silvers. I’m just headed over to Bradshaws now and will see you shortly! I love the last one too, April! Grumpy Cat fits right in with the cool greys.